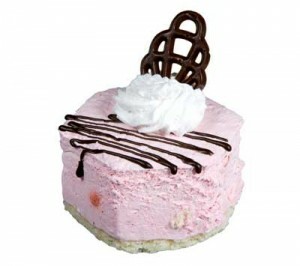 A summer frozen dessert designed for company as it serves 15! Won’t go back to the ice cream cake after having this scrumptious mousse style frozen square. Can be made ahead of time and frozen, using either fresh or frozen raspberries. It looks upscale, without all the fuss. You’ll have to bring it to every event though, from now till… well ever. note: pull your 2 eggs out of the fridge so the whites will be room temp for using in the filling. And whip the whip cream ahead of time too & put in fridge, clean out the mixing bowl well, though, as egg whites won’t whip in a bowl that has any residue of fat. Bake at 375 degrees F 15-20 min Stirring twice. Remove, break up any chunks… scatter 2/3 crumbs over 9×13 pan (or into spring form pan) reserve the remaining 1/3 crumbs for the topping. Beat whites first till meringue like, add everything else but the whipped cream. then fold in the whipped cream by spatula just enough that you don’t see any white of the whipped cream. Pour on top of the 2/3 bread crumbs in 9×13 pan (or spring form pan) sprinkle rest of crumbs on top. thaw maybe 5 min before serving so it can be cut with a sharp knife. Notes: We’ve also made this in the small cheesecake pans approx 5″ in diameter, it’s nice if you want a few smaller desserts on hand instead of a big huge one. If you’re quick, squares can also be popped out of the pan and into large Tupperware style containers with waxed paper between and re-frozen if using for a catered event for quick plating. Drizzle chocolate over the bottom of the plate, slice into triangles and add some fresh raspberries for garnish. Perfect for 50th anniversary celebration, summer party, and corporate events, even just for the family, very versatile and all ages request it again and again. Remove, break up any chunks… scatter 2/3 crumbs over 9×13 pan (or into springform pan) reserve the remaining 1/3 crumbs for the topping. Beat whites first till merangue like, add everything else but the whipped cream. Pour on top of the 2/3 bread crumbs in 9×13 pan (or springform pan) sprinkle rest of crumbs on top.